What is the Herxheimer Reaction. And What Could Happen During a Cleanse? 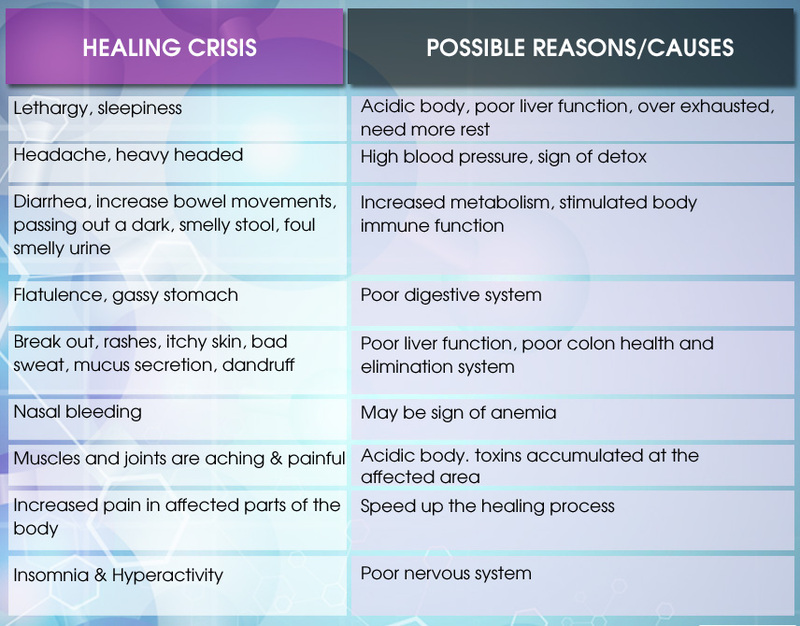 The Healing Crisis or as it is formally known, The Herxheimer Reaction, is characterized by a temporary increase in discomfort during the process of a detoxification cleanse. It occurs when toxins and wastes are being released faster than the body can eliminate them. The complaints of the healing crisis may vary from none, to mild or severe. NOTE: A general rule of thumb is: the more toxins there are to eliminate – the more severe the affects of the detoxification. As the body is cleaned up, previously dormant innate healing mechanisms can be spontaneously reactivated and various types of tissue regeneration can be accomplished. During regeneration, the body destroys defective tissues and cells in order to reconstruct them. This can be experienced as pain or inflammation or even just unusual aches, pains and fever. During healing, the immune system will set to work killing off pathogens like viruses, bacteria, fungi and parasites. Destroying these can result in the release of by-products released by the pathogenic organisms as they are killed. These must also be flushed out of the body during cleansing. In a severe toxicity-related health picture, long-term toxicity can eventually contribute to serious degenerative illness such as arthritis, cancer, chronic fatigue syndrome, viral illness, depression, anxiety, diabetes, etc. The reaction is an indication that the process of cleansing and detoxification is working and that your body is cleaning itself of impurities, toxins and imbalances. The reactions are temporary and may occur immediately, within several days or even several weeks later. But, depending on the levels of toxicity, other possible reactions are:. •	Some people feel ill (flu like complaints) during the first few days of a cleanse because your body is dumping toxins into the blood stream for elimination. The ill-affects usually pass within 1-3 days. On rare occasions, they may last several weeks. •	Sometimes, the discomfort during the healing crisis is of greater intensity than before starting the cleanse. •	Another crisis may come after you begin feeling your very best. •	Or, there may be many small crises to go through before the final crisis is experienced. •	The healing crisis may bring about experiences of past conditions. While people often forget the diseases or injuries they have had in the past, they may be reminded during the healing crisis. NOTE: many people experience little or no discomfort – at all. In any case, the cleansing and purifying process is underway, and stored wastes and toxins are in a free-flowing state. The severity and duration of the healing crisis is an indication of amount of toxins and wastes stored in your body. Better out than in! NOTE: a well-crafted whole body cleansing and detox program should provide a thorough, yet gentle cleanse. And, the program should allow the user to choose to target cleanse specific areas like: parasites, colon, digestion, liver and other organs as well as the whole body. There is differing data on the timing of a Herxheimer reaction. Some data indicates that it usually occurs between four and 24 hours from the onset of treatment. Others note that between Day 3 and Day 5 of a treatment program is often when the reaction is most noticeable. What appears to be most accurate is that reaction times -- and indeed whether there will be any reaction at all -- are strictly dependent on the individual being treated. Duration of the reaction also varies widely, from an hour or a few hours to days or even a week. 1. The human body seeks to externalize disease from deep internal organs to more superficial levels like the skin. It will also heal from the inside out. Healing will usually occur on the inside of the body before the outside and the curative process will work its way out of the body from there. For example, someone with asthma may develop a skin rash as his or her body attempts to resolve the asthma. Unfortunately, in modern medical protocol this rash would most likely be treated with cortisone cream. This type of suppression of the body's natural healing process could result in the condition going back inside again to re-affect the lungs. 2. Healing events tend to proceed from the head downward. By this he meant that the body typically exerts healing energy to resolve ailments at the top of the body (near the head) before it will tend to ailments at the bottom of the body (near the feet). 3. The healing of illnesses in the body will occur in the reverse order to development. The most recent health challenges will be resolved first and the old illnesses will be healed last. For example, the body would work on healing lung tissue from a recent bout with pneumonia before it would work on healing kidney tissue from a childhood kidney disease. This experience of healing through our past health challenges has been called "retracing". 4. The healing will occur in a cycle. We will endure a healing event followed by feeling wonderful and then we'll just "coast along" for a while until our body has gathered up enough strength to tackle another healing task. Just as we will consciously ensure that we are well rested before taking on a big job like cleaning out the garage for example, our body will only address big issues when it has the strength to do so. In between these healing events we can experience periods of glorious wellness as we begin to know what it feels like to be 'in balance'. If the reaction is too severe, cutting back on the dosage or frequency of use can be very helpful in lessening symptoms but allowing the healing process to continue. Sometimes stopping for a day or so and then beginning again at a lesser dosage can allow for quick relief. The best assistance for the body is drinking plenty of distilled water (a half gallon a day is recommended). 1. Drink plenty of fresh water to flush the body of toxins from the detoxification cleanse. Some professionals recommend distilled water as the best. Drink from 3 to 4 quarts (or liters) per day. This will help flush the toxins out of your system and speed along the detoxification. 2. A headache may indicate insufficient water intake … drink more water! 3. Avoid “white” foods. White flour products (bread, pasta, etc), milk and all dairy products, sugar and starches (white rice, potatoes). 4. Eat light meals. Chicken, turkey, vegetables and soups are especially beneficial. 6. Be kind to yourself, and get the rest that you need. If you are feeling fatigued or sleepy, your body is telling you to rest. NOTE: On occasion, a reduction of the dosage or temporary cessation may be required until the severity subsides. Symptoms frequently disappear immediately after a good bowel movement. A good massage might be helpful to speed up the healing process and reduce the discomfort. The benefits of a detoxified, pure body far outweigh any inconveniences that you might experience during the process. Many people describe experiencing a feeling of lightness, others are unable to describe what they experience other than to say they can’t remember when they felt better. HOW CAN I BE CERTAIN THAT I AM EXPERIENCING A HEALING EVENT? How do you distinguish a healing event from an actual worsening of illness? This is not easy to do and can take some trial and error combined with close observation of your emotions and body and a true sensitivity to your inner wisdom. Luckily, to help you recognize a healing event, you can count on a few common characteristics. 1. You will likely be feeling quite fabulous or at least better than usual just before the onset of a healing event. It seems that the body will tackle healing projects once it has built up enough strength to face them. This strategy is similar to more conscious human strategies. For example, your wisdom tells you that you'll need to be well rested before tackling the task of spring cleaning for example. 2. During a healing event, you'll usually feel a sense of well-being and congruency about symptoms. Despite feeling ill, you will not likely develop any deep dread or resistance to the experience. For example, you may be nauseous and even perhaps even vomiting (which is never fun), yet able to maintain a sense of peace with these sensations. You may be vaguely aware of an inner confidence that the vomiting is a healing and cleansing event. During an emotional healing event or the emotional component of a whole-body healing event, you will most likely feel the symptoms but identify with them less than usual. It's hard to imagine that you could have anxiety without being anxious about having it. You will still experience the emotion; you will be able to accept it without allowing it to take over your whole being. You will feel a confidence that it is temporary and will be short lived. This could be likened to the feeling you have as you run from the cold car in the winter into the warm car without putting your coat on. You will feel the cold but are not concerned by it because you know you will have relief just as soon as you get into your nice warm home. 3. The timing of a manifestation of symptoms can be logically related to an increase in your healing or detoxification efforts. For example, you may have just started a new emotional therapy or a new type of massage treatment. Perhaps you increased an anti-viral or anti-fungal herbal remedy. You may even have made a significant step in your emotional development by, for example, quitting a job that was "toxic" to you. It's common to have a healing event in response to significant life changes. 4. A true healing event will usually be quite short lived. Several hours to several days duration is the norm. In situations of long standing toxicity or extreme candida or other pathogenic infestations, it may last longer because the initial "clean up" from these sorts of conditions can take a significant period of time. If you feel seriously ill and are not confident that your symptoms are harmless and temporary, consult with your Naturopathic or Medical Doctor. Keeping your body cleansed and refreshed with a natural cleansing supplement is the best insurance against declining and failing health. 1. People who choose to maintain their Radiant Health, should consider a detoxification cleanse . . . it’s good insurance for maintaining their edge. 2. People who feel their health slipping away should consider whole body cleansing . . . it’s their second chance at health.